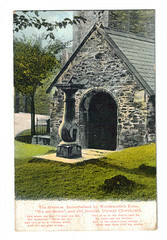 In 1907, someone who we only know as “L” visited Colwyn Bay in wales and sent a postcard of a grave to “Miss Banfield” in Herefordshire. 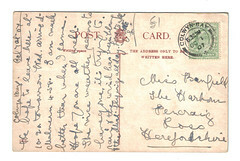 A couple of years later, “L” visited Colwyn Bay again, and sent another postcard to Miss Banfield. 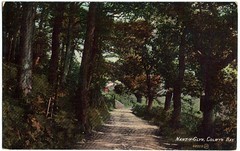 This time it was of a wooded roadway in country Wales. A hundred years later, these postcards turned up at the markets in suburban Brisbane, and my mum, who knows I love postcards, bought them for me. So we can now read these brief personal messages between these two people, both of whom are probably long dead. This inspires me to keep sending postcards to the furthest reaches of the planet. Who knows, one or two of them might outlive me, and someone in a century might be wondering who “Neil” was and why he sent such wierd postcards! 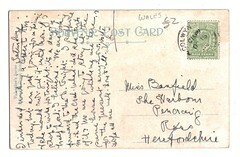 By the way, if you want to read what “L wrote to Miss Banfield, just click on one of the images above. 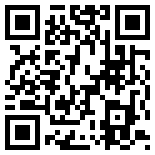 I managed to transcribe it.